With Culture Day less that 48 hours away, things are down to the wire and today and tomorrow are full of preparation. With last week’s finals over, there’s little else to do on campus besides clean and practice cultural dancing (Nevermind the CAT my computer students have to take on Friday). I was assigned to the Savai’i house, and it has been pretty fascinating watching the routine take shape. I admit I missed the first couple weeks of Culture Day practice, but that was mostly because I hadn’t been told about it or because there was, you know, teaching to be done. And then one day during interval, one of the other teachers got a little snappish about how I never show up to practice. I interpreted this as an invitation. So I started showing up. It should be pointed out that I do little more than watch and occasionally take pictures during Culture Day practice. Occasionally Fiu, one of the other teachers assigned to Savai’i, will finish addressing the kids and then look at me and ask if I have anything to add, but I figure the Samoan kids got the Samoan dancing down better than I do. I was in a musical or two growing up, and I’ve seen dance practice in The States. A choreography takes the company through the song step by step. The company learns those steps, commits them to memory, tries it from the top, moves on. Here, there is no choreographer. Once it’s time to step, someone raises his hand, comes to the front, and demonstrates his suggestion for the next 8-count (my term). More often than not, the suggestion is accepted. The group learns that step, commits it to memory, tries it from the top. Then someone else raises his hand for the next part. So in the end, the routine is a string of different dance moves offered by many contributors. Culture Day practice began with girls and boys separated. As we’ve gotten closer to actual Culture Day, more and more of our time is spent with both groups together. Separating made sense earlier on because the two groups sing and dance to the same song, the routine is different for each with a few exceptions. 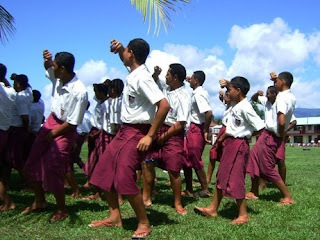 At one point, one of my year 11 girls, Joanna, had to teach the 60 boys in the Sava’i house the part of the dance where the boys do the same moves as the girls. This was taught as a routine more in the American style of choreography. It was funny to see Joanna navigate the line between being giddy, almost flirty with the boys and controlling the situation and being a authority on that part of the dance. The boys were just as giggly. The collectivist choreography plays itself out on a larger scale in terms of the choosing the songs and the overall structure of the routine. After the students had done a full run-through of the routine last week, Fiu walked over to Talapusi and said, “Why don’t we add in another song?” So Talapusi nodded and walked over and sang the song with the kids, and made sure everyone knew it. I’m not entirely sure how everybody knows every Samoan song. I don’t know what the equivalent would be in The States. We have our own patriotic songs, but there aren’t that many. I’m also not sure how groups ensure they’re not singing the same song as another group. But it always goes back to that conversation Blakey and I had about how it almost seems like Samoans have their own language they use to communicate with one another. Oh wait, they do. Still fascinating though. I hope you’re bringing your contribution to the routine. Pictures below. Boys practicing. Wearing their matching red Jandals. One of my year 12 students, Pene, leading practice. Combined practice. Girls in the front and back. Boys in the middle. This is actually looking at the formation sideways. Typically, boys would be in the center and girls would be on either side.